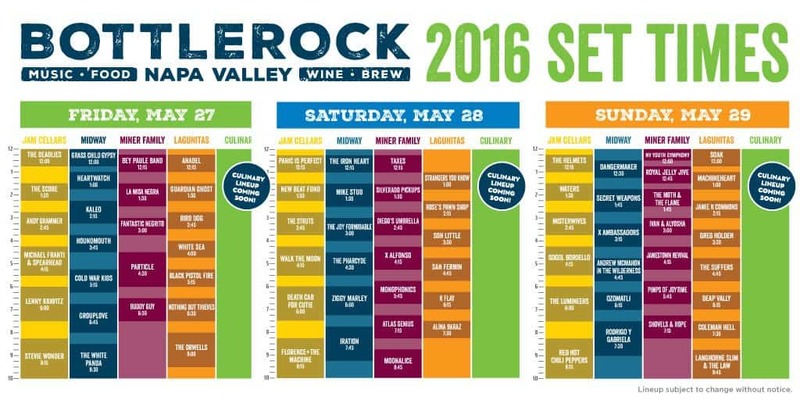 The Bottlerock Napa 2016 Set Times are out! The BottleRock Music Festival is back with another amazing lineup for 2016. With The Red Hot Chili Peppers, Stevie Wonder and Florence & The Machine Headlining the 3-Day Music Festival, this is one event you won’t want to miss! All Buses will leave directly after the festival. There will be multiple buses and the last one will leave by 10:45PM at the latest. Get there in style! Mride and The SF Bus have provided luxury Round-Trip Transportation every year since the festival began and we can help to make your experience a good one. Don’t get stuck on a crowded bus or take a $200 Uber when you can hop on a plush bus and enjoy some drinks on the way. We have a few surprises in store for this year as well! -The busses are BYOB. There is a market a block away from the pickup location if you would like to grab some drinks for the ride. -Everyone will receive an information card with contact information for the Driver and Bus Organizer to make sure no one gets left behind!